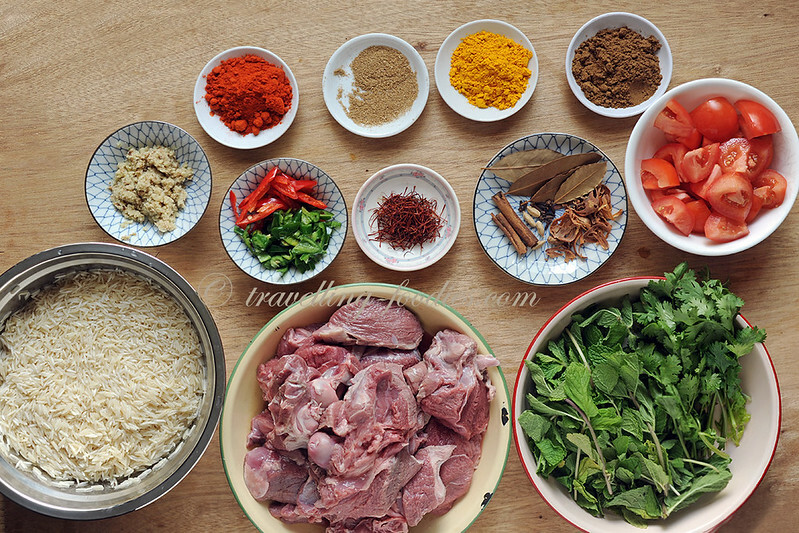 The ingredients for preparing biryani is quite extensive, owing to the range of spices and herbs used. 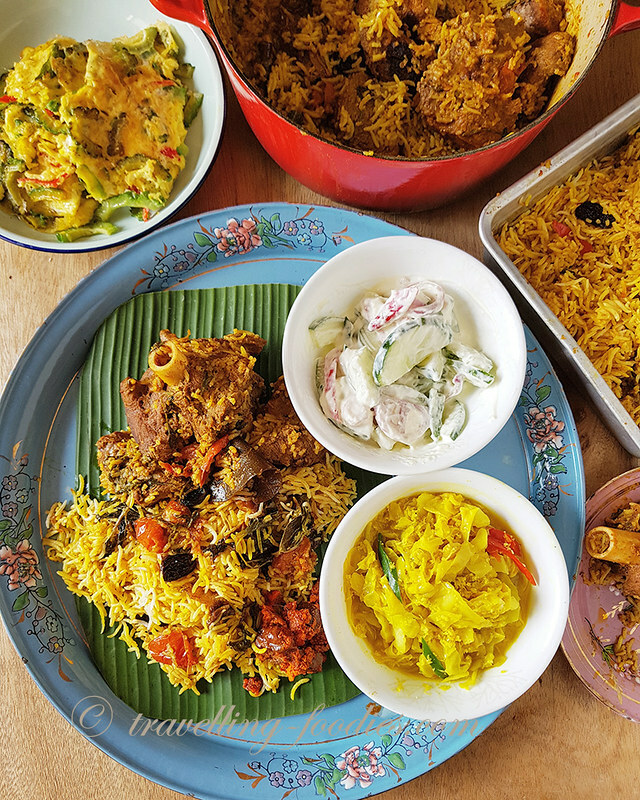 Together, they form a complex bouquet of flavours and aromas which help to build the taste of a good biryani which many of us are familiar with. The choice of rice de facto for cooking biryani is with long grained basmati. I often get a question, “what brand of rice did you use?” I have no answer to that as the rice I bought is “nameless” as it was repackaged by the little shop in Little India where I bought it from, who imported the rice in large sacks. The important thing about cooking the basmati is the soaking and the parboiling. Soaking helps to work the moisture into the grains so as to shorten the cooking time. 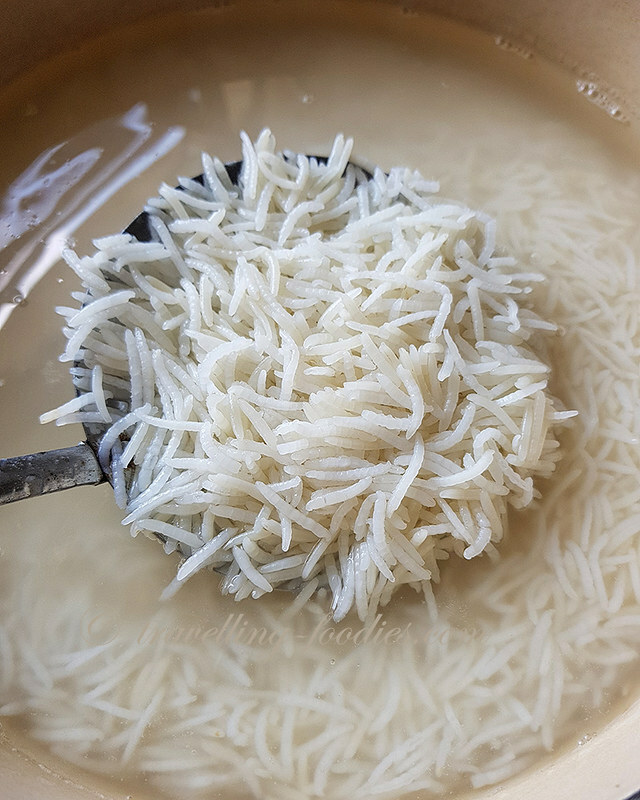 Salt is added to both the soaking and parboiling to ensure that the rice is fully flavoured as the rice is simply left to steam above the marinated lamb in the final stage of the cooking process. “How to keep the grains so long and beautiful?” some of you might ask. 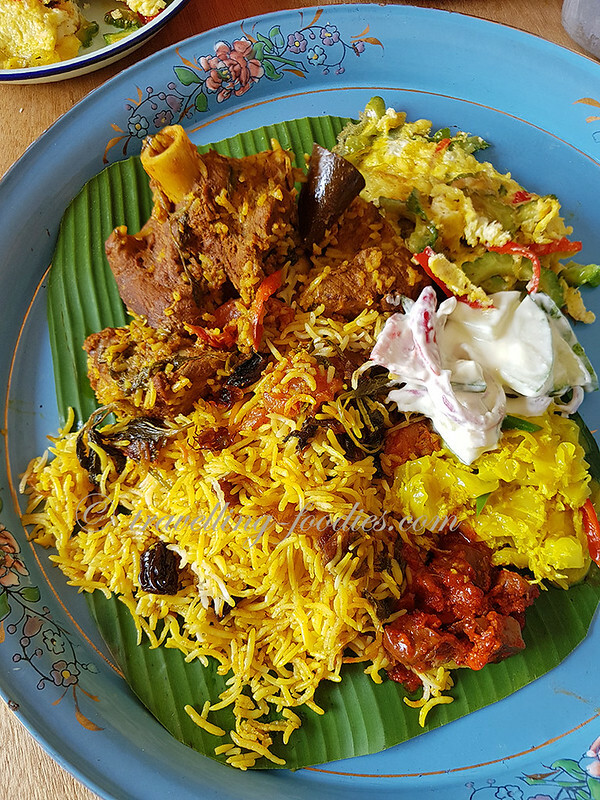 Well, it is important to avoid disturbing the rice too much during the initial soaking, parboiling process, and to ensure that the parboiled rice is spread as carefully as possible over the lamb during the cooking. The lamb chunks are first very briefly sauted in the french cast iron casserole I am using before adding chopped tomatoes and giving everything a good mix in before spreading the parboiled rice over. Mix all the marinade ingredients in a large mixing bowl to form a thick slurry. Pour in lamb chunks and massage the pieces with the marinate paste until everything is well coated. Add half of the coriander leaves, mint leaves, fried shallots, mix well and set aside to marinate for at least 1 hour. Rinse the basmatic rice well until the water turns clear and then top with more water to cover the grains. Add 1 tbsp salt and set aside to soak for 30-45 min. Bring a large pot of water to boil and add drained basmati rice grains. Make sure that the boiling water covers the grains by at least an inch. Bring to a boil before lowering a gentle simmer for 8-10 min or until the rice grains are around 70% cooked. Drain the partially cooked rice and set aside. 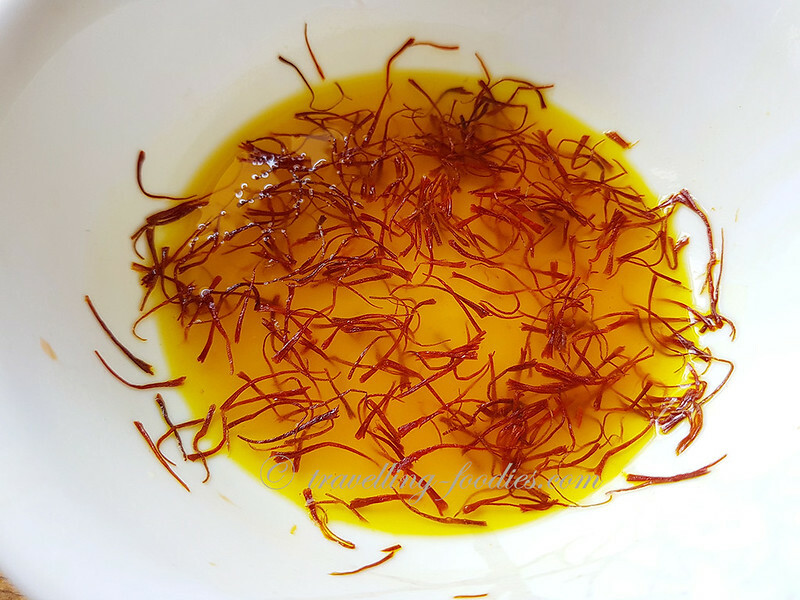 To a small bowl, add saffron strands and 3-4 tbsp of the hot water used in parboiling the rice. Mix well and set aside. To a large pot or casserole, add some oil and then the marinated lamb chunks. Saute briefly before adding chopping tomatoes. Spread the parboiled rice over the top carefully. 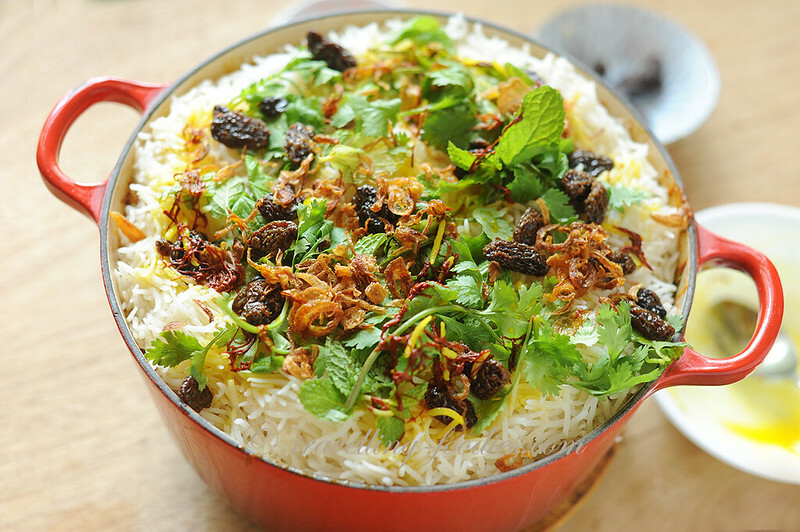 Sprinkle raisins and the remaining chopped coriander leaves, mint leaves, fried shallots over the rice. Drizzle saffron water and strands over the top of the rice and add the melted ghee/butter. Cover and cook over the stove with medium high heat until the mixture begins to boil slightly. Lower heat to the lowest possible and cover tightly. Add weights like another heavy lid over the top if necessary to help contain the steam within the pot as the lamb and rice is cooked with its only moisture. If required, seal the edges of the cover with a dough made simply out of flour and water but this was unnecessary for me as I was using a cast iron casserole and topped with another heavy lid. Slow cook for 45 min to 1 hour over the stove. 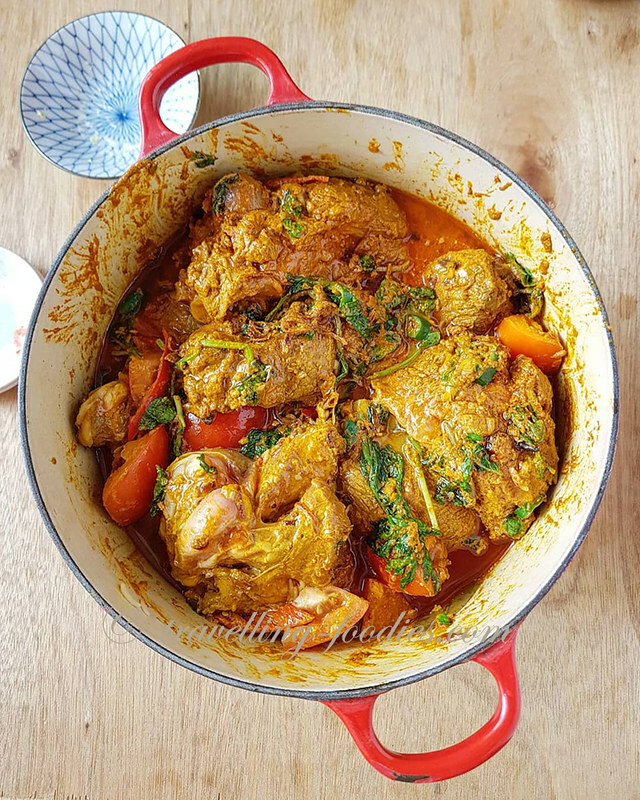 Otherwise, cook over the stove for 30min and then transfer to a pre-heated oven at 170 degrees Celsius and continue to cook for another 1 hour until the meat is tender. Rest the pot for another 20-30 min covered. Fluff the rice carefully in order not to break the grains and serve immediately while hot with other side dishes like raita or some mango pickle. 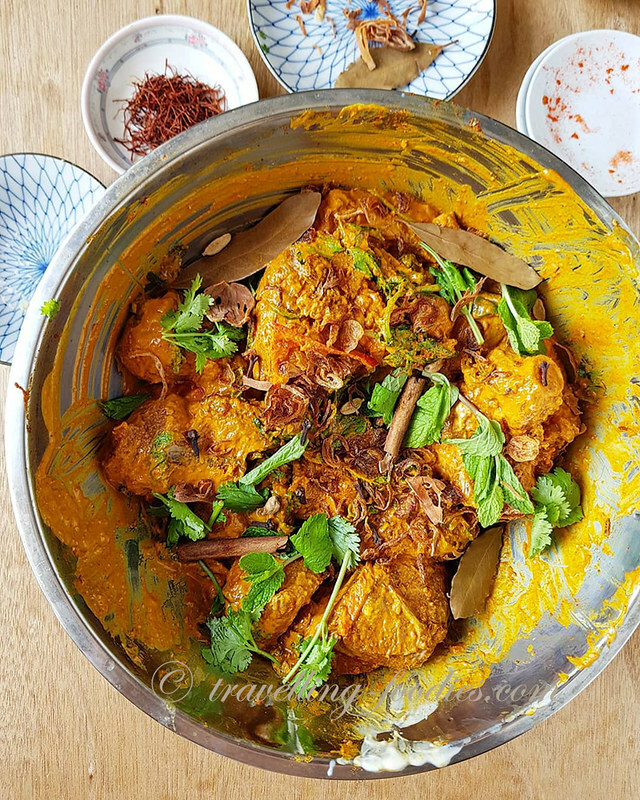 This entry was posted on October 3, 2018 by Alan (travellingfoodies). It was filed under Food, Simple Eats and was tagged with biriyani, biryani, dum biryani, hyderabad biryani, mutton biryani, nasi biryani, persia, saffron. I miss your posts! Always enjoyed reading and trying out your recipes!